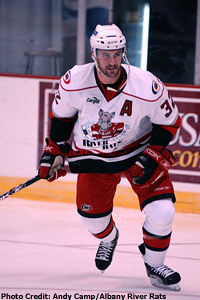 The River Rats' Trevor Gillies signed a one-year deal with the Hurricanes organization for the 2008-09 season. Many hockey players would feel that veteran Albany tough guy Trevor Gillies is living in an off-season paradise. Gillies spends his summers in Augusta, Ga., and lives about 15 minutes from Augusta National, the home of The Masters. Though it's true that you can't simply grab your bag and hike over to the first tee for a quick 18 holes, most golf-crazed hockey players would likely love to hang out near the hallowed grounds just to be near history and hope it rubbed off on them. Not Gillies. He doesn't really care for golf. "If Bill Gates and Michael Jordan can't get on, Trevor Gillies isn't going to get on. It's not something I'm going to try to accomplish," he said. "It’s like 100 degrees. Sitting out there sweating in a golf shirt at a sport I'm not good at is not my idea of fun. I'm more in the gym, doing my thing." Right, the gym. That's always been Gillies' bread-and-butter. His bodywork has served him well since his rookie year in 1999-2000, and it will put food on the table for at least one more season. Gillies, 29, recently signed a one-year deal that will return him to the Carolina organization for 2008-09. A broken hand limited him to 51 games with Albany this past season. He's got his sights set a little higher now. "I plan on going to camp and taking that job (with Carolina)," Gillies said. "(Leaving) didn't cross my mind at all. I wanted to be in Carolina. I'm in a situation where I want to go up there. They know what I can do." Actually, Gillies' NHL potential is still a speculative issue. Although he's done his job well in 300 games for six AHL teams (20 career points, 1,177 PIM), he's played just one NHL game — with Anaheim in 2005-06. "I believe in myself and I believe I will attain more (NHL) games," Gillies said. "How my career has gone, I wouldn't change it. I don't mind playing on different teams. You go where the opportunity is. I've enjoyed seeing the countryside. A lot of good things have come from the game." And even he gets a turn to be a bit of an end-to-end offensive threat. Instead of worrying about the links, Gillies plays in a summer hockey league. "I'm like Wayne Gretzky out there," he said. "I can score whenever I want." "I don’t know about Wayne. Maybe Mark Messier," he joked. "There's no hitting, but you rough them up." Truitt's pattern continues — Jeff Truitt's career path seems to move with the consistency of a metronome: Assistant coach. Head coach. Assistant coach. Head coach. Assistant coach. Head coach. That continued at the AHL level on Tuesday, when Truitt was promoted from assistant in Springfield to the No. 1 job. Previously, Truitt held the No. 2 and then top job in Kelowna, and an assistant's spot in Lethbridge was a stepladder to the top job with Camrose of the Alberta Junior Hockey League. "It just seems to be the tendency for my career," Truitt said. "You've got to learn before you take the next step. Things happen when they happen. That’s just what’s been dealt to me." Truitt, an assistant in Springfield this past season, replaces Kelly Buchberger, who coached the Falcons for a season and is expected to be promoted to the parent Edmonton Oilers. "With Kelly, you learn an awful lot. He treats the players well," Truitt said. "He's a positive, optimistic guy. I'm a pretty technical coach. On the other hand, you try to find a balance. Kelly had a really good balance. That impacted me quite a bit. You get the best out of the players if you communicate with the players." Foley reflects — Though Pat Foley was exile from the Blackhawks the past two seasons, there were times the legendary Chicago broadcaster felt like he had never left the NHL. Perhaps that’s because he worked for the closest thing to it the AHL has to offer, the Chicago Wolves. Earlier this week Foley returned to the Blackhawks, the team he spent 25 years with before his two-season stint with the Wolves, who won the Calder Cup last week by finishing off Wilkes-Barre/Scranton in six games. But he refused to see his time in the minors as a player would — that is to say, as a demotion. "It's a fun game to watch. It was a lot of fun. I really enjoyed my time there," Foley said. "The biggest part of that is the Chicago Wolves. They consider themselves the 31st NHL team, and they operate that way. Had I finished my career as the voice of the Wolves, it would have been fine with me." From Avs fan to player — The Colorado Avalanche was always a team well within forward Marty Sertich's grasp — if he wanted to buy a ticket. He did that several times in college, making the short trip from Colorado College to Denver to catch the team in person. "The Avalanche are a great team every year with great players, great traditions," Sertich said. "They were always a fun team to watch." Come training camp, Sertich will be able to do more than watch the Avs — he'll have a chance to earn a job with them. That door was opened to him last week when the Dallas organization shipped him to Colorado for a conditional choice in the 2009 Entry Draft. Sertich, 25, was a main attraction in his own right in college, winning the Hobey Baker in 2004-05. He was also solid in Iowa the past two seasons, pacing the team with 27 goals and 52 points in 2007-08. But he's yet to get closer to a real NHL game than the stands. There's not much mystery about why — although he's obviously talented, at 5-foot-8 and 165 pounds, size is an issue. "I think it's just overall strength. I've always been a smaller guy out there," he said when asked if size had held him back. "The summers are huge for me to improve my strength. I'm taking it as a positive that Colorado wanted me. I'm just hoping to make a good impression in training camp. Getting a chance to play there is pretty special." Around the AHL — Michael Leighton's huge season for Albany paid off big time. The AHL's goalie of the year signed a two-year contract with Carolina that will pay him $600,000 per season in 2008-09 and 2009-10. Not bad for a sixth-round draft choice (Chicago, 1999) who has played in just 50 career NHL games. … The Syracuse Crunch has locked up defensive forward Trevor Frischmon with an AHL deal. Frischmon, one of the team’s most improved and energetic players last season, scored the series-winning overtime goal in Game 6 vs. Manitoba. … Hamilton has exercised its options on the AHL contracts of forwards Thomas Beauregard and David Desharnais for the 2008-09 season. Beauregard, a forward, spent his entire rookie season in the ECHL with the Cincinnati Cyclones, finishing first on the team in goals (31), second in points (65) and third in assists (34). Desharnais, also a forward, split the season between the Bulldogs and the Cyclones. He led the ECHL with 106 points. … According to the Winnipeg Sun, Moose captain Mike Keane, 41, recently completed the Manitoba Marathon in a time of 3:39:36. … The Hamilton Spectator reports that Bulldogs winger Jonathan Ferland has signed a deal to play in Austria next season.